Spool shaped circular body, moulded midband; moulded octagonal base and top separated from spool by bands of reeding. Shallow circular receptacle for salt and four scrolled projections on top. Reeding at bottom. 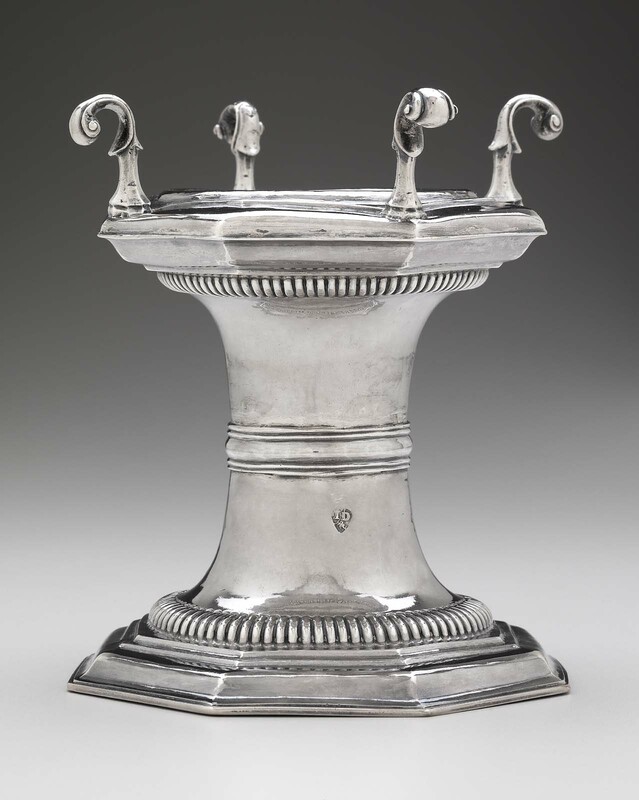 Only three American silver standing salts are known to survive, all from Boston, including this example by Jeremiah Dummer, the first native-born North American silversmith. The two others were made respectively by Edward Winslow and the partnership of John Allen and John Edwards. It is thought that Dummer, who apprenticed to John Hull, in turn may have trained Winslow, Allen, and Edwards, as well as John Coney and several other Boston silversmiths. English in style, Dummer’s standing salt-used to hold the table condiment that at the time was relatively rare and thus worthy of an elaborate receptacle-is a good example of the early Baroque style. It features a smooth spool-shaped body, with an applied midband at center that contrasts with bands of reeding at its top and bottom. Supported by a hexagonal foot, the body is topped by an upper section with a shallow circular receptacle designed to hold the salt, and with four scrolled upright projections that are meant to support a covering napkin, plate, or vessel. One of the leading silversmiths of his era, Dummer was also an active church and civic figure. At his death, an obituary in the Boston News-Letter noted that he “had served his country faithfully in several Publick Stations, and obtained of all that knew him the Character of a Just Virtuous and Pious Man.” Dummer’s sons Jeremiah and William, who became lieutenant governor, went on to achieve great prominence in Massachusetts politics and public affairs. Engraved R Russell above reeding at bottom, Rebe on edge of top.